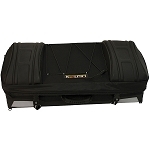 ATV Bags are a quick affordable solution for your ATV gear hauling needs. They mount/unmount easily and are lightweight making them much more user friendly then the more common ATV cargo boxes. Our ATV Bags are water resistant and keep the dust out surprisingly well. Most of our ATV Bags also feature zipperless closures so you can spend more time riding and less time hassling with broken zippers. Our ATV Bags are designed to mount on any ATV with just a quick strap and buckle attachment. We carry quality bags from brands like American Trails, Kolpin & Tamarack. We offer free shipping on all orders over $100 and in most cases your order will ship out within 1 business day.